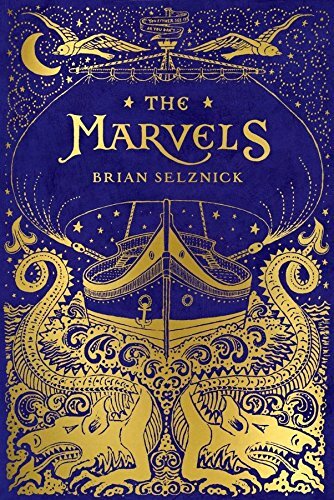 The Marvels by Brian Selznick, author and illustrator of The Invention of Hugo Cabret, is a multilayered masterpiece in which the illustrated story tells of a theatrical family, the Marvels, from their ancestor Billy Marvel, shipwrecked then rescued, who comes to England to help build the Royal Theater in 1766, to the unexplained mystery of Leontes, where the Marvel line appears to end. The ebb and flow of time in The Marvels is handled through newspaper articles, obituaries, and wedding announcements—events in life that concretely mark the years. As the Marvels thrive in theater, their family life is filled with sons named for Shakespearean characters, and tantrums on and off stage as each son tries to find his path. Alexander Marvel, a scoundrel, is confronted with his abandoned son, and is left to raise Oberon, who turns out to be a greater actor than his father. Oberon in turn tries to force his artistic-minded son, Leontes, into the theatre but meets resistance. Leontes finds solace with his mad grandfather Alexander who lives below stage. In the early stages of dementia, Grandfather Alexander accidentally sets fire to the Royal Theater, and Leontes rushes in to save him—here the illustrated story seems to end and turns to Mr. Selznick’s prose. It is in the middle of the story that readers find the beginning, which could be any time in modern day: a boy named Joseph, troubled and awkward, runs away from school in hopes of finding his Uncle Albert in London. Uncle Albert guards a series of mysteries under his roof and in his heart. Uncle Albert’s house is a character in itself. The address of 18 Folgate Street in The Marvels is a model of the real-life historical Dennis Severs’ House at the same address. Both real and fictional houses are a place where time has stopped in Victorian London, recaptured from tapestry to tile, china to chairs, and where recordings of what Victorian London would’ve sounded like outside the house windows plays inside. After a successive turn of events where Joseph seems to do nothing right, he discovers a set of tape recordings that tell the lineage of the Marvels, recorded by Uncle Albert. Joseph begins to hold hope that he is a descendant of this family, and that he and his family are more than what they seem—a mother enamored with wealth, a father concerned with appearances, and mysterious uncle never spoken about, who might be quite mad like Alexander Marvel. Joseph eventually learns the truth of the Marvels, who they really were, where they came from, and who Uncle Albert really is, beneath the gruff and strange exterior. Without giving away the lovely twists and turns that enhance The Marvels, the motto Aut Visum Aut Non (Either you see it or you don’t), should give readers a clue, as it eventually does to Joseph, about the nature of truth and time. Soon the illustrations return, and Joseph is a grown man, with his own family, like Uncle Albert’s—one that is made by choice. Also included in this book is a small map of the places in London that inspired The Marvels, with addresses, websites, and information on each place. The Marvels is truly an apt name for this book, not just because it is about the Marvel family, but because it is about the marvel of human forgiveness and imagination.